As Kellogg Insight recently reported, research by Efraim Benmelech and Carola Frydman shows that in the right context, a military background can serve a CEO and a company well. But what about the flip side of that coin? 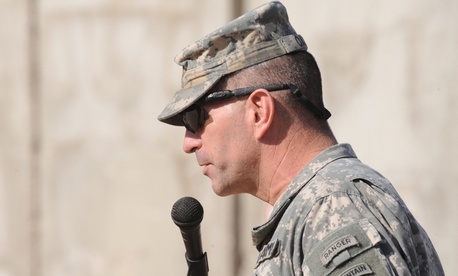 How can business leadership skills help the military create better officers? U.S. Army Colonel Rodney Haggins came to the Kellogg School in 2013 as an Army Chief of Staff Senior Fellow to address this question. Along with sharing wisdom as a decorated military veteran, one of his objectives at Kellogg is to generate recommendations for how the Army can improve its force management. Given time away from the day-to-day demands of military life has provided room for self-reflection. “I’m thinking about total leadership: my own, my reference points, why I think and feel the way I do about things as a leader,” Haggins says. “There have been several things I have seen over the 27 years I have been in the military where I thought, ‘oh, we can do that better,’ or ‘this doesn’t seem right to me.’” This year at Kellogg has given Haggins the opportunity to add some rigor to those passing thoughts. In what areas does Haggins see room for improvement? Haggins believes increasing access to executive education-type courses may serve as a means to build more reflective and effective leaders. “Only about the top 5 percent of colonels go to the Army War College,” Haggins says. The Army War College provides professional education for senior military officers and their counterparts in federal agencies and foreign armies. “But after experiencing executive education here [at Kellogg], I see potential to extend general management, leadership and strategic thinking courses to other senior and mid-level leaders and civilians. If we can deepen our bench by expanding career broadening opportunities to benefit the leader, we’re going to be better overall as an Army.” This would model the FBI’s recent expansion of custom executive education programs. While at Kellogg, Haggins advised a student group project that sought to enumerate the economic costs and benefits of developing talent in the U.S. Army. What the group found is that while it may be difficult to precisely quantify the costs of developing talent, doing so may assist future civilian employers in determining how qualified veterans are for jobs outside the military. With the unemployment rate for Iraq war veterans ages 18 to 24 significantly higher than that of the general population, accounting for the financial investment the Army makes in training may serve veterans and employers alike. “I thought I understood leadership,” Haggins says. “I thought I was strong on the knowledge front. But leading by example is only one aspect of leadership.” The War College and Kellogg have helped Haggins recognize the need for military officers to consider the psychological and sociological aspects of leading individuals and organizations. You only have to read the latest Defense Early Bird or service newspaper to witness the evolution of military justice, as leaders officers are being relieved of commands and duties due to misconduct and “toxic leadership” styles. The days of the screaming drill sergeant may be drawing to a close, with the Army coming to a better understanding of how power is distributed and networked across hierarchies. Fred Schmalz is a writer and editor at the Kellogg School of Management. This article originally appeared on Kellogg Insight.